Third-year Matt Slodzinski is captured during mid-swing warming up. 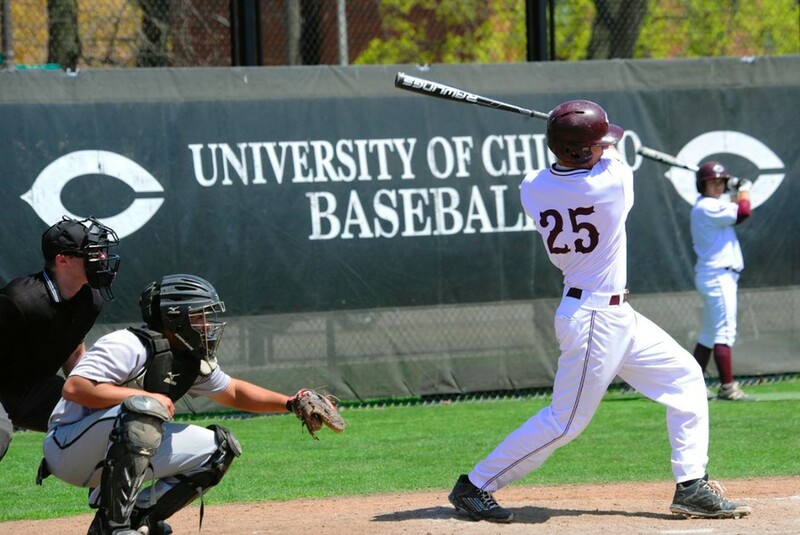 The UChicago baseball team came through with a big seventh inning to eliminate an early 6-2 deficit against Dominican University (6–16) on Wednesday. The Maroons (15–5) strung together five runs in the seventh to run the score to 7–6 and would hold on to this lead the rest of the game. The Stars jumped out to an early lead, plating two runs in the first inning and another four runs in the third. The Maroons struck back, scoring one in the first and another in the fourth, but stranded a runner at third in the sixth. In the seventh inning the bats came alive for the Maroons—the inning began with a walk of first-year Payton Jancsy which was followed up by a single up the middle by fourth-year Tim Sonnefeldt. The first run of the inning came in to score on a fielder’s choice ground out to shortstop by second-year Max Brzostowski. The next run came in on second-year Connor Hickey’s second single of the day. Three more runs would come in on subsequent singles by second-years Ian Bohn, Brady Sarkon, and Josh Parks to run the score to 7–6. The Stars struck back right away in the top of the eight, with the first two batters getting on base via a single and a hit by pitch. This led Chicago to bring in closer third-year Michael Davis. The first batter he faced sacrifice bunted the runners over, leaving Davis to intentionally walk the next batter to recreate the force out. The intentional walk paid off as the next batter grounded into an inning-ending double play. The Maroons would hold on to their lead the rest of the game as Davis retired the side in the ninth to pick up a six-out save. The Maroons look to continue to build off this comeback victory as they take on North Central (9–7) and Beloit (8–11–1) this weekend. While neither team has a remarkable record, it’s crucial for the Maroons to continue taking wins from regional teams. North Central will come to Chicago on Friday. This matchup should stand to be a hitter’s duel, as they average over 7 runs per game and the Maroons are average 7.6 runs per game. North Central is currently sharing the top of the CCIW standings with Illinois Wesleyan. On Saturday, the Maroons will hit the road at the completion of their nine-game home stand and head up to Beloit College. Beloit has lost a lot of close games, indicating that their record isn’t a holistic view of their true talent. The Maroons will continue to pace games with their bats, as they are currently ranked fifth in Division III with a .349 team batting average. They are led by superstar Hickey, who is pacing the offense with a .442/.511/.636 slash line. The Maroons have nine hitters who are hitting right at or above .350 on the season. Chicago will next see action on Friday at home against North Central at 3 p.m. They will then head out to Beloit to play two on Saturday. The first game is scheduled to start at noon.